A Pair of Heavy Duty Quick Detach Sling Swivels. 1.0 Inch sling loops will fit slings up to 1" width sling. Mount on any standard swivel studs and feature a quick detach lock. Quick Detach feature will let you add and remove your sling quick and easly with no tools needed. Rated to hold over 300lbs, Zinc Alloy. Great upgrade for your rifle or shotgun. Package inchlude: 2 Pcs Sling Swivels. More ordering q'ty, more unit freight cost saving. 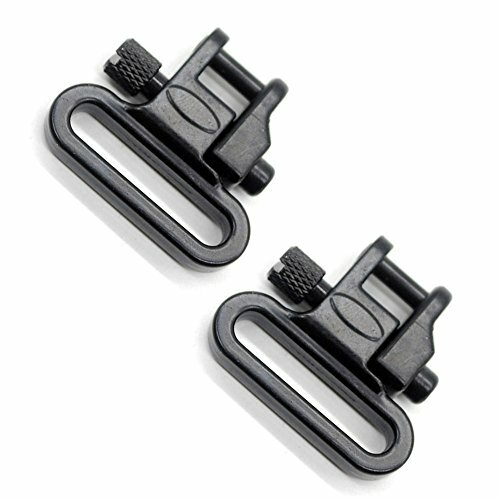 A Pair of Heavy Duty Quick Detach Sling Swivels 1.0 Inch with a quick detach lock. Mount on any starndard swivel studs smoothly. Made of High Tensile Strength Metal with fine black finished. Machine Screw type and wood screw rear base. If you have any questions about this product by Trirock, contact us by completing and submitting the form below. If you are looking for a specif part number, please include it with your message.